Kosei Tanaka announced Thursday he will make the first defense of his WBO flyweight title on March 16 in Gifu against compatriot and former light flyweight title holder Ryoichi Taguchi. 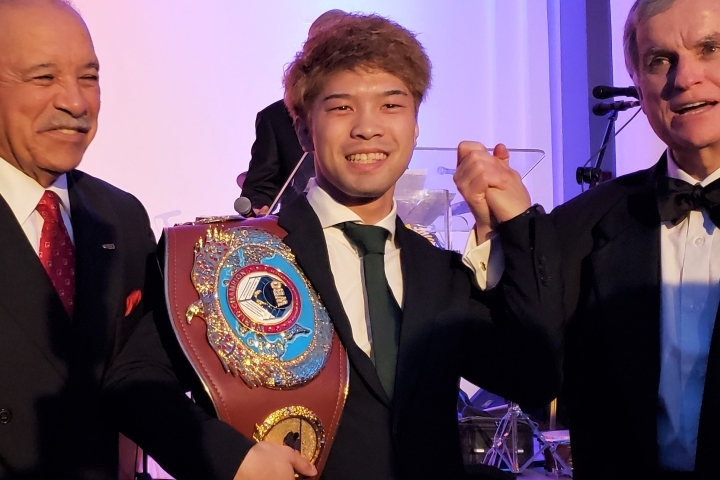 At 23 years and 3 months, Tanaka became the youngest of six Japanese boxers to claim world titles in three weight classes when he defeated then-champion Sho Kimura last September. Tanaka matched a world record of accomplishing the feat in just 12 pro fights, improving to 12-0 (seven knockouts). He previously held the WBO’s light flyweight and minimumweight belts before moving up to flyweight. He had once given up on fighting Taguchi after suffering fractures in both eye sockets when successfully defending his light flyweight title in September 2017. The 32-year-old Taguchi, who had held both the IBF and WBA light flyweight titles, lost to South African challenger Hekkie Budler last May. The Japanese boxer said he hopes to bounce back in the heavier division. “Since I had been worried about losing weight, I think I’ll be able to put on a better performance,” said Taguchi, who is 27-3-2 (12 KOs). Share the joy UFC on ESPN+ 8 Weigh-in Results: Middleweight showdown set for Ft. Lauderdale Saturday’s UFC event in Ft.